I live in a city that is built with cement and brick. Sidewalks are grey, roads are made with black tarmac and buildings are either grey, shades of brown or reflected glass. Walking down a sidewalk in Toronto is not always dull though. 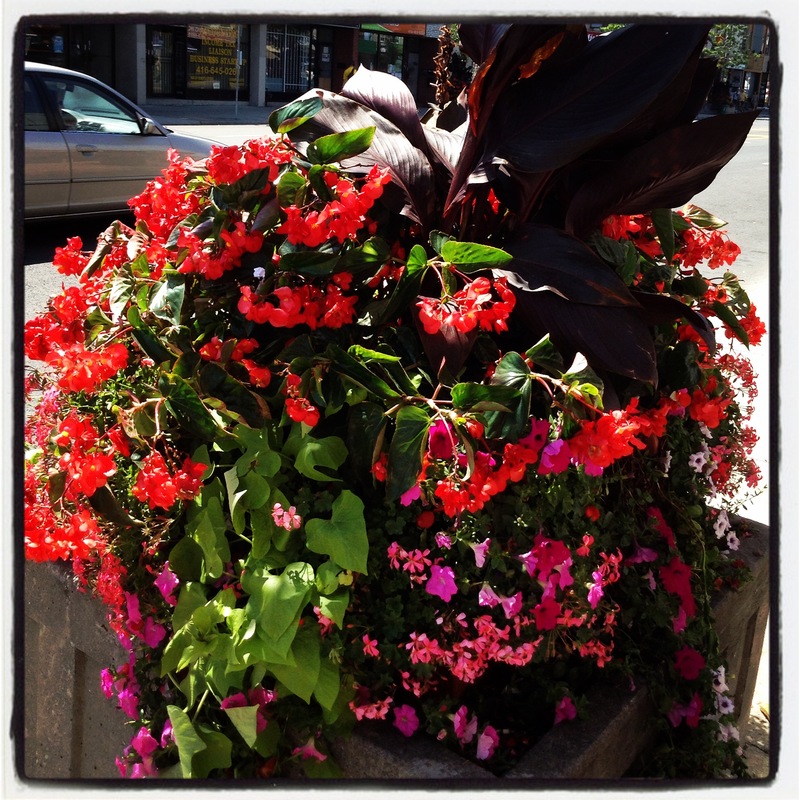 Many streets have planters that are filled with a riot of colour. 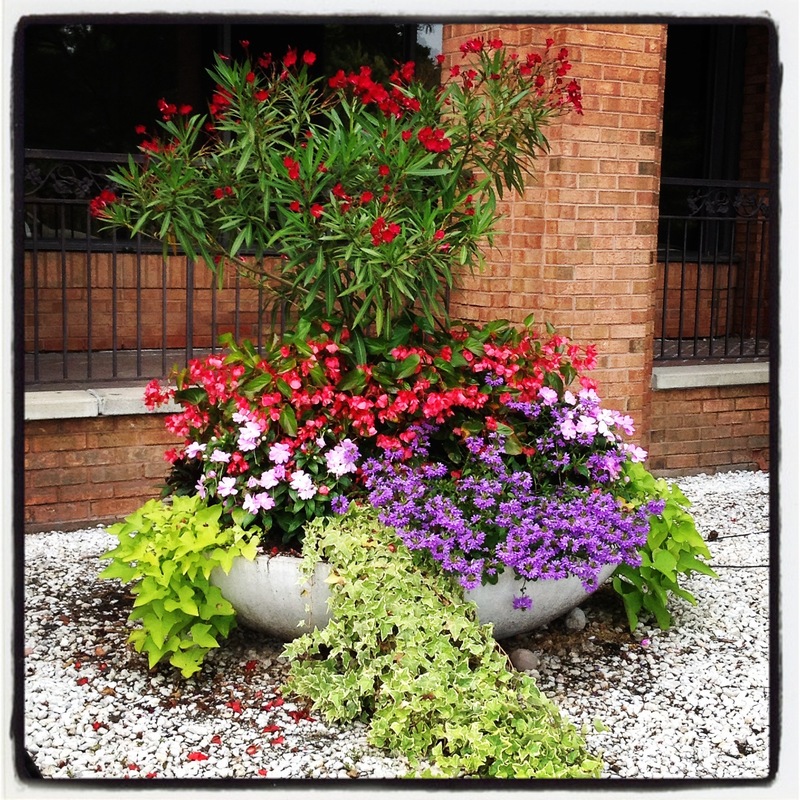 I enjoy the summer flowers that overpower the gray planters they are in. The colours are bright and pleasing to the eye. Plants are not only found in planters, however. When I walk the streets in my neighborhood, I pass many flowerbeds that grace the sidewalks. 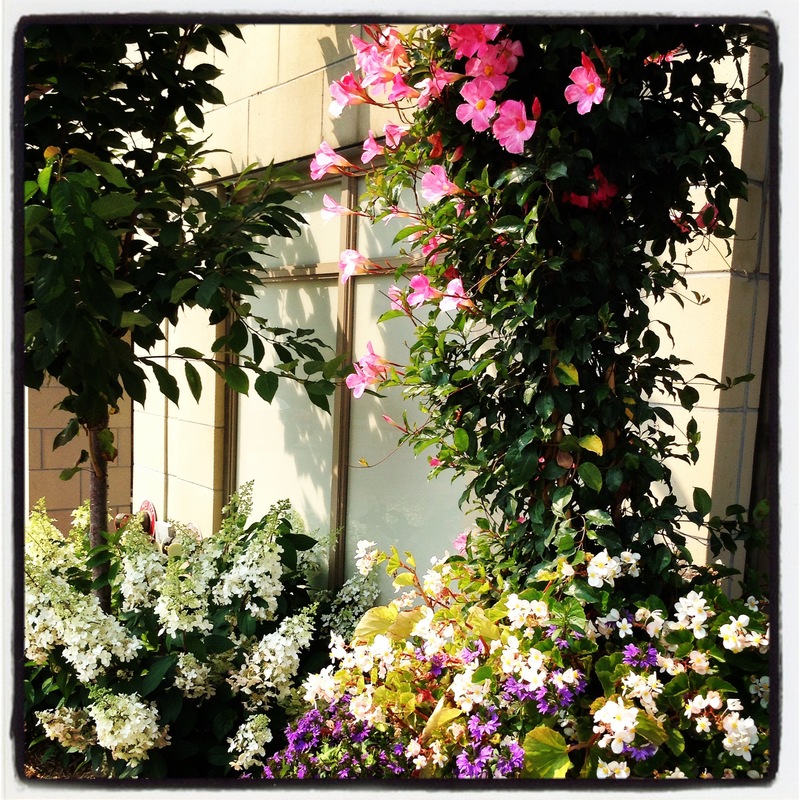 Mid-summer, these plants are spilling over the edges and bring a sense of beauty to the streets. Because these streets have flowerbeds does not mean that flowers in planters do not abound. I enjoy seeing both on the streets I walk. Each week I am grateful for the flowers I see. 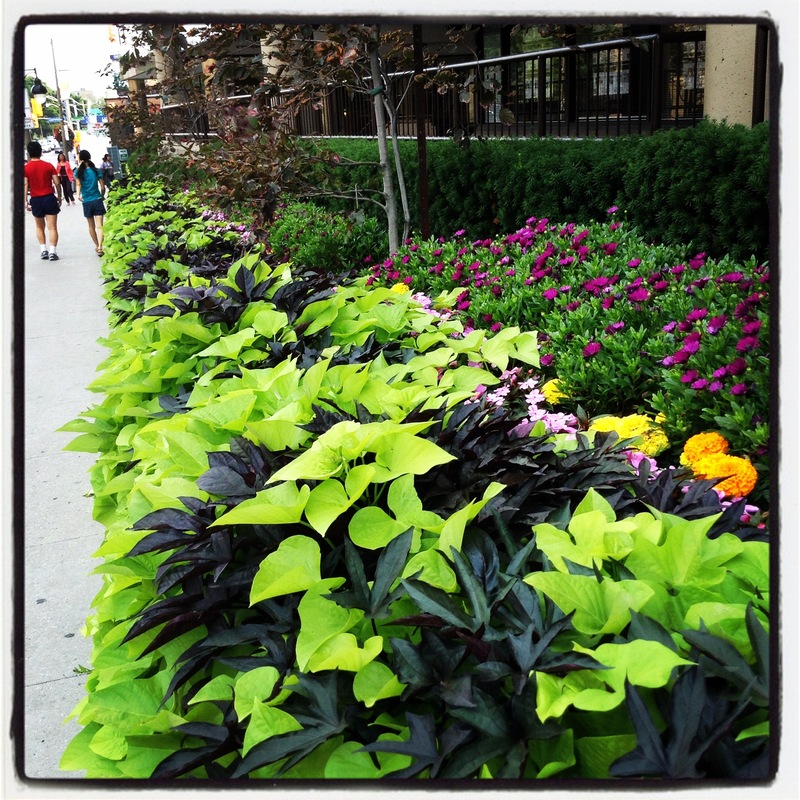 I say a little thank you to the city as well as the landlords of offices and apartment buildings for the floral beauty that graces the streets of Toronto. Gratitude Wednesday: Oh the (Minneapolis) Parks! It’s great to see the beauty of nature on the streets. It does indeed brighten everything around. Great post, Colline! Thank you Angeline. The sight of flowers certainly brightens my day – especially when the skies are a little grey. It is definitely beautiful Michelle. I agree that the streets of Johannesburg would look more pleasant with flowers on the pavement. Beautiful Colline. I’m trying to figure out where some of these places are. The first photo looks like Bloor West Village. Thanks, Colline, for spear heading this. Beautiful; especially now as we segue way into Fall! What I like especially is that they change the planters mid-fall with hardier plants. Gorgeous flowers! Nothing is as beautiful as a full display of gorgeous blossoms. I am lucky Gemma as I have been to cities where there is not a flower in sight. Oh no! Is that even possible?! Yes. The first that comes to mind is the city of Johannesburg, a place I used to go to everyday when I was working there. I can’t imagine! No flowers? Sad. It was something we were used to. Now when I visit there, I do see the lack. I’m grateful to see flowers along the street. Such a beautiful post, Colline! Your street flowers are so colorful. You inspired my post today! Thanks Colline. Stunning flowers Colline. I tend to think we have lots of flowers and greenery in Gib, but it’s really the end of Main St where I live. It’s easy to take it for granted when you see flowers, trees, greenery, even a fountain every day. It is easy, I agree. That is the hope I have with this Wednesday challenge – to become more aware of what it is we have, and to be grateful for it. They really brighten up the street, and hopefully attract birds, and bees, and butterflies. I have never seen butterflies and bees around the flowers – though I have not really looked. I find downtown Toronto is quite lovely too . I have not been downtown Montreal though, I must check that out. I love the architecture here though…so much history. I have been through Montreal quite quickly and I do admit to being intrigued by the architecture. You must try to visit during our Jazz festival..it’s around the same time as TO’s but we are smaller here and there are about 12 stages set up in the same area and you can walk down to Old Montreal, visit the Old Port .. So bright and beautiful! And perfectly captured. 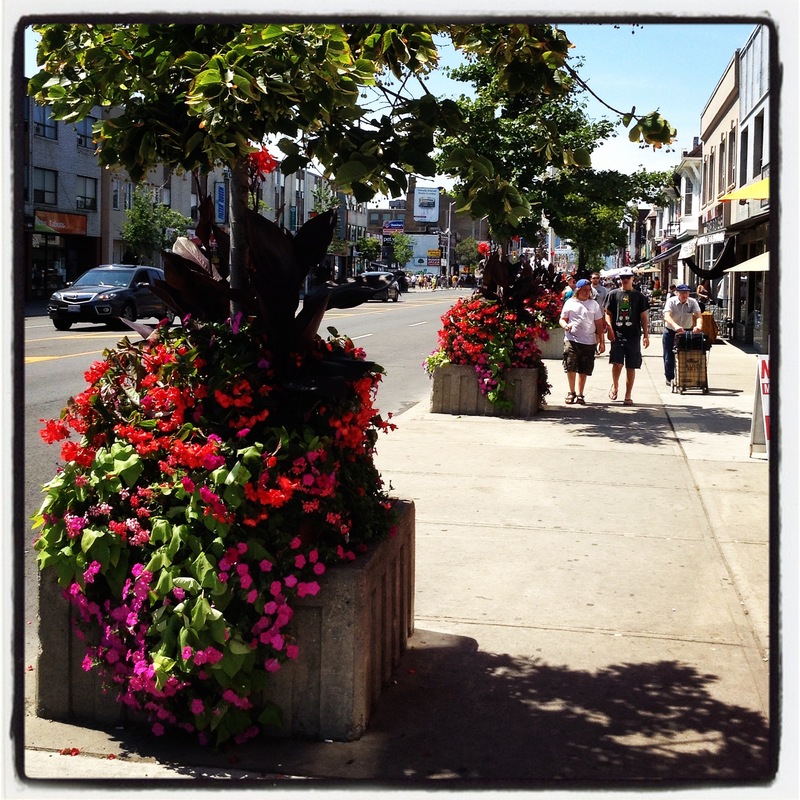 A streetside planter is my favourite. I love that one too – especially once summer is in full swing and the flowers are at their best. You have shared some beautiful photos with us Amanda. I agree. It is one of the things that bring a bit of colour to the city. Sometime this week I will write a post about gratitude in response to your lovely photos and words! Thank you! Thank you very much. I, however do not know how to copy and paste due to the fact that I have a chromebook which pops up with copy and paste, it seems at random! I don’t know how to access it through my will! I will try what you said though and see if I can touch the right place to see what I need! Again, thank you! A beautiful city that holds its pride for all to see. It would be a pleasure walking those streets for no other reason than to enjoy the beauty. I do enjoy seeing the flowers Ian. I find it brings a certain character to the streets.